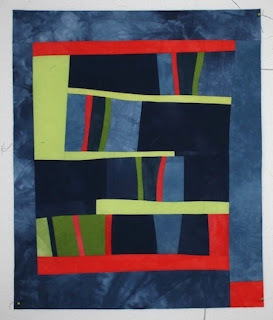 In May, I made this quilt top using my fabric scraps left over from the Twelve by Twelve Colorplay challenges. 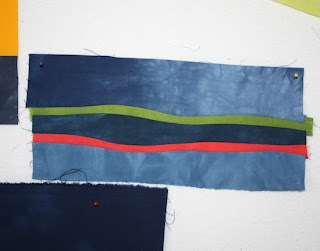 First, I put together some thin strips of fabric, "à la Brenda". 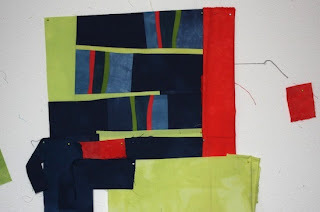 Then I cut them up, and pieced them back with more fabric scraps. 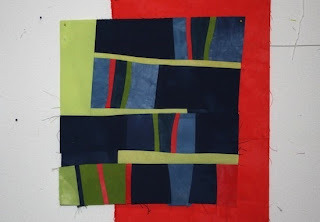 My first idea when I started this piece was to make another small quilt with an orange background, to go with this one. But I liked it so much better with a blue border that I gave in. It still has to be quilted. That will be for later. Now, I'm reading some weaving books that I bought last year. I must decide what new techniques I'll try out in the next months. Love what you have done with left over scraps. The colors are working very well together. Enjoy your summer!! 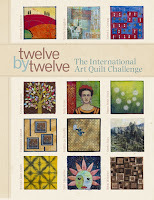 You have some amazing leftover pieces to make stunning quilts with!! Isn't it fun creating these kind of quilts from what you already had? Stunning, you have such an amazing design sense I love the balance of this piece. It looks great and lots of fun. That looks like a lot of fun! Nice color choices. Enjoy planning your weaving projects! That is absolutely gorgeous. I'm so glad I stumbled on your site. Fabulous result with your left over pieces!